Nick Clegg has today joined the race among UK political parties to sound tough on immigration to the UK from the EU, and Mark Leonard (someone who ought to know better) has written a piece for the Fabian Society advocating that Labour ought to be tough too. Let’s just quickly recap what happened with EU enlargement, and what it meant for immigration to the UK. Result: a lot of people move to the UK from the new countries as a result. Result: 60000 move to the UK. Hardly a crisis. State of the UK economy then: transition periods end in 2020. We do not know what the UK economy will look like then. Result: Croatia is so small, and 27 countries will open their borders in 2020, so the UK will not be flooded with Croats. Beyond 2020 we do not really know which countries will join when. The countries of the Western Balkans, and Iceland, could join – Serbia (7.1 million), Bosnia (3.8 million), Albania (3 million), Kosovo (1.7 million), Montenegro (0.6 million), Iceland (0.4 million) – that’s a total of 16.6 million. These countries are not going to join en masse, and transition periods of up to 7 years will be imposed by the whole EU-27. So floods of people from this region are unlikely. Turkey is currently going backwards in its efforts to join the EU due to the authoritarianism of Erdoğan, so is out of the picture for a long, long time. So, here’s an idea for UK politicians: due to the fact that the major reunification of the Europe – the 2004 enlargement – is now complete, the problem of EU migration has largely passed (if indeed it was really ever a problem). So why not just shut up about it, and just explain that things have moved on? Where is this information from? As far as I can tell, Sweden has never used the option to restrict immigration from other EU countries. Croatians are free to move to the remaining 14 EU countries. People from the 13 EU countries with restrictions may be restricted from moving to Croatia. @Richard – a fair piece by Hodges actually. But note above I am not advocating hitting this issue head on, because I realise how complex and toxic it is. When it comes to freedom of movement from the EU there has been a change, as I outline, but British politicians do not seem to have noticed it (or their rhetoric sure has not changed). Because that would be far too rational? 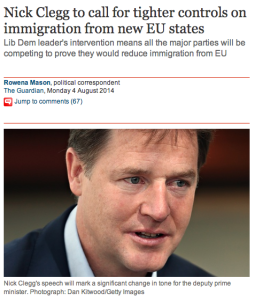 “It’s easy to blame the mainstream party leaders for their vacillation and duplicity over immigration. They either find themselves accused of being party to a reactionary “arms race” on the subject, or of having a tin ear to a rising tide of public anger. But in reality they are trapped between absolute and political truth.